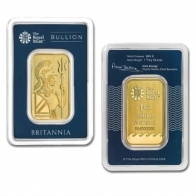 Buy British gold bars, including the newly released British Britannia gold ar. All British issued gold bars have a fineness of 999.9. British Britannia gold bars are available for delivery worldwide or for Swiss storage.